One of the more beneficial modifications to make to an early Z is to upgrade the alternator. By increasing the output capacity of the alternator, it helps the charging system cope with additional draws on the electrical system that weren’t necessarily there when the car was originally built (such as higher wattage driving lights, powerful car stereos, etc). This article provides information to assist with the conversion from the Datsun external voltage regulated style of alternator to the AC Delco/Remy 10SI or 12SI style of alternator used for many years on GM vehicles. The intent of this article is neither to try to cover the many different years nor to provide a full step-by-step procedure on carrying out a conversion to a GM alternator. Rather it is to present the information related to the GM style alternator that will help you accomplish the conversion yourself. You will have to bridge the gap using this information to your particular application. The AC Delco / Remy alternator has four connections on the back and back-side. These are as follows. An insulated stud protruding from the back of the alternator. This is the main power output terminal of the alternator. 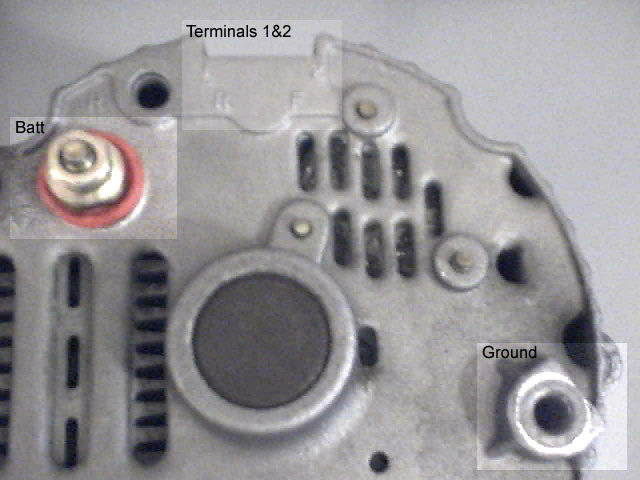 Usually labeled ‘1’ and/or ‘R’, this is one of the two terminals combined into a single connector on the side towards the rear of the alternator. It is also known as the relay terminal. Usually labeled ‘2’ and/or ‘F’, this is the second of the two terminals combined into a single connector on the side towards the rear of the alternator. It is also known as the sense or field terminal. This will either be a wire that obviously protrudes from the inside of the alternator (the internal voltage regulator actually) or simply a bolt on the case of the alternator with no obvious further connections. This bolt may or may not be labeled on the alternator case; some alternators may not even have the connection (grounding through the case instead). Each of these connections is now discussed in more detail. The Batt wire is the wire that should be connected to the battery via a fusible link. Rather than connect it directly to the battery, it is preferable to connect it to a junction box in turn connected to the battery that powers other electrical circuits. A minimum of 8AWG cable should be used. Where the battery is located in the trunk, 4 or 6 AWG is suggested. By connecting to a junction box (or power distribution block) and by connecting the sense (see below) wire to this junction also, it prevents the battery from receiving an incorrect voltage and improperly charging. Terminal 1 is known as the relay terminal and should be connected to a switched (ignition) feed. When installing in a Z-car, a resistor (or the dash alternator fault lamp) and a diode should be connected in series on this wire. This terminal switches on the alternator when the ignition is switched on. The diode is necessary to prevent the alternator from feeding back into the ignition circuit and causing the car to continue to run when the ignition has been switched off by the key. With low-output alternators there may not be sufficient power back-feeding through the circuit to keep the engine running but with 100 amp alternators there certainly is. Diodes are directionally sensitive; in fact, they are designed to allow current to flow through them in only one direction. The diode should be installed with the ‘bar’ end towards the connector on the alternator. A 1N5401 diode rated to 3 amps should be sufficient. The resistor is necessary to provide the initial load to alternator. In GM vehicles, this ‘resistor’ may actually take the form of a charging light in the dash. That is, this lamp is wired in series with the connection and acts as both a charge warning lamp and the resistor needed to activate the alternator. Once ‘activated’ the alternator is basically ‘self-sustaining’. Make sure the resistor is rated for the current that will flow through it. For example, a 10 Ohm, 10 Watt resistor worked fine for my application. Terminal 2 is known as the field or sense terminal connection. This is a lower gauge wire connection (such as 14 or 16 gauge). It doesn’t carry much current as it is used to monitor the voltage level in the cars electrical system and ‘excite’ the alternator into operation if it falls below the preset value (set by the voltage regulator). Quite often, this terminal is connected to the Batt terminal on the alternator however doing so negates a key advantage. By connecting this terminal to a central point in the electrical system, the alternator will regulate the voltage at that point. That is, accessories will drop the voltage in the system so if the sense terminal is simply connected to the Batt terminal, the alternator wouldn’t necessarily be regulating the overall electrical system’s voltage to that set by the regulator. To a large extent the difference this makes will depend upon how the accessories are connected and also upon how long the connection is between the Batt terminal on the alternator and the main distribution point it connects to. It is best to connect the sense terminal then to a central distribution point from which accessories are also connected; this will ensure that the voltage at that point is maintained at the correct level. Where the ground connection consists of simply a bolt threaded into the casing of the alternator, a ground wire should be attached to this that is of equal gauge to that of the battery wire. This wire should connect to a good chassis ground (i.e. on the firewall or frame). On alternators with a ground wire from the internal voltage regulator circuitry, it is sufficient to use at least as heavy gauge as that wire, again connecting it to a suitable chassis grounding point. In one wire operation, the alternator will not begin charging until the engine rpm reaches a threshold. This rpm threshold will vary with pulley size but generally speaking it is anywhere from 1200 to 1600 rpm. The reason for this is that the alternator itself generates a small amount of current to the voltage regulator and this turns on the voltage regulator. The alternator needs to spin fast enough to generate enough current and thus the situation where when the car is started, it is necessary to rev the engine to actuate charging. It sometimes isn’t obvious by looking at the alternator but one-wire alternators can usually be connected as three-wire alternators by the simple removal of a rubber plug at the edge of the casing at the rear. By connecting these alternators in three-wire operation, it is possible to make the alternator begin charging when it detects battery drain. Thus, when you start the car and run it at idle, the alternator will automatically come on when required. The alternator will continue to run from that point onward. This is really the ideal set-up. The letters SI (Systems Integrated) designate that the voltage regulator is built into the alternator itself. The main differences between the 10SI and the later 12SI alternators is that the 12SI alternators will typically have a higher output and better cooling to compensate for the additional heat generated. The size of the alternator pulley in relation to the crankshaft pulley helps determine how effectively the alternator will charge at idle and is also important from the perspective of ensuring the alternator does not spin higher than its rated rpm at high engine speeds. The target for most alternators is to spin them fast enough at idle that they will generate at least 12 Volts or so. While this is minimally sufficient to power the vehicle, accessory equipment is designed to run at a little over 14Volts. In practice, the standard pulley that comes with the 10SI alternator (between 2.5 and 3 inches diameter) is usually fine to use when installing the alternator on a Z-car. It isn’t absolutely necessary to fabricate or purchase a bracket to mount the alternator but it is recommended. 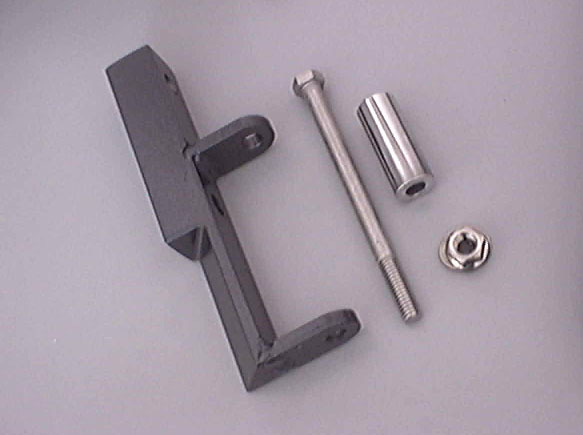 By turning the alternator ‘upside-down’ in relation to how it is usually installed on a GM vehicle, you can mount it on the Z without the use of a bracket. When upside-down, the bottom hole of the alternator will bolt up to the front mounting hole for the old Datsun alternator, the top hole will bolt up through the standard sliding adjusting bracket. Doing so will leave the pulley one or two mm out of alignment with the crankshaft pulley but this seems to be reasonably tolerable with the V shaped belt. I have had no problems with the belt coming loose, however that is not to say that it couldn’t be putting undue wear on either the crankshaft or alternator bearings. There is a company that fabricates lower brackets to allow the alternator to be fastened more securely: ZCarCreations LLC. Their bracket costs approximately $90 USD, is machined, coated, and is of good quality. It also comes with some spacers to help get the pulley alignment exact. The company can be reached via the internet at http://www.zcarcreations.com/. Here are a couple of pictures of the bracket and some of the hardware. When I purchased my early 1974, 260Z, I inherited a partial conversion from the Datsun alternator to the ‘Chevy’ alternator. That is, the external voltage regulator had been removed, the amp gauge was disconnected, and although the alternator was connected such that it did keep the battery charged, it did not work properly at idle and there was some evidence of fried wiring. The alternator itself was mounted upside-down in order for the pulley to line up. Since my wiring harness had been somewhat mangled already (wires cut as opposed to harnesses disconnected), and as I planned to replace my working and non-working dash gauges with new Autometer units, I decided to complete the conversion and clean up the wiring for the 10SI alternator. I didn’t really have to ‘disconnect’ anything. At its simplest, most GM style alternators can function with only a single (hot-battery) wire connected, grounding through their casing. Unfortunately when connected this way they do not switch on properly at idle, nor do they maintain the correct voltage at the battery and I was having problems with my lights dimming. The batt terminal was connected to the ‘hot’ connection on the starter, and this was in turn connected to the battery itself. As mentioned before, a better method of connection is to run the alternator’s batt connection to a power distribution block and then on to the battery itself. I will eventually make this change. By connecting to the starter as with the original Datsun installation, it was possible to avoid making changes to the fusible link set-up. I connected the sense terminal to a power distribution block. This block also feeds power to the MSD ignition system, aftermarket lights, and connects also to the battery via a fuse. I connected the relay terminal to a switched positive source, putting a resistor (10 Ohm, 10 Watt) in series. This worked fine until I upgraded the alternator from a 63 Amp model to a 100 Amp model. I found the 100 amp model output a strong enough current on this terminal that it caused the car to ‘run-on’. That is, it was maintaining the voltage level on the ignition circuit and the car would not shut off. The fix was easy; a diode was added in series with the resistor (1N5402 3 Amps). Note: The relay terminal is designed so that it is grounded when the ignition is first switched on but puts out 12 volts when the alternator begins charging. The concept behind this is that instead of a resistor like I have used, you would normally have the dash charging warning light wired in series. Thus when the ignition is switched on, the dash light would come on. Then when the car is started and the alternator begins charging, the dash warning light is extinguished. The amp gauge was replaced with a 0-15 volt gauge from Autometer. This is relatively straightforward to connect as you simply need a switched + V source. It shouldn’t be connected to a battery line voltage as it will remain on after the car is switched off and drain the battery. One day I noticed that the alternator was sitting at a bit of an angle and I realized that even with lock washers, it isn’t really sufficient to mount the alternator without the proper bracket. The rear ‘ear’ is required to hold the alternator safely in position as the tension on the pulley eventually helps work the alternator loose and it starts bending inward towards the motor. I ordered the bracket (described elsewhere) and installed it; this corrected the problem. Installation of the bracket is straightforward. It comes with some aluminum spacers to ensure the pulley is aligned correctly with the water pump and crank pulley. The supplied bolts are stainless steel and quickly polish to a chrome-like finish on a buffing wheel. 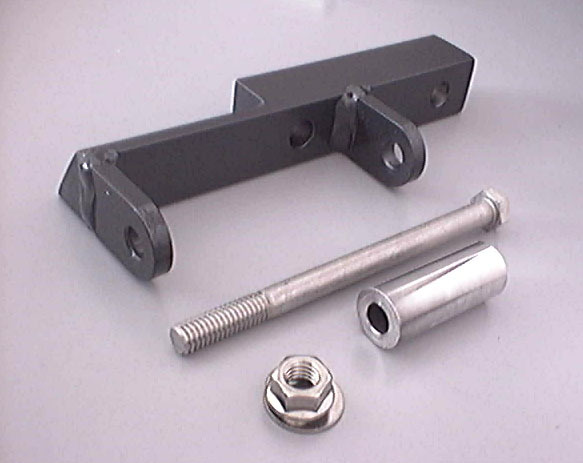 I added some flat washers under each bolt to prevent the powder-coated surface of the bracket itself from marring under the split washers. For reference, I used a PowerMaster polished aluminum 100 amp alternator with good power at idle characteristics (70 amps at idle). The model number was 27294 and it retailed for a little over $200 CDN. It came with a V-groove pulley installed and this worked fine. As you can see, there isn’t a great deal required to get the alternator properly functioning and charging the battery. With this said, there are a few things that will be particular to your year of car that you will need to address. In electric fuel pump equipped cars there are usually two relays that control the on/off operation of the fuel pump. One of the relays is controlled by the starter/ignition and the other relay is usually part of the alternator circuit (refer to your electrical diagram). The purpose of this second relay will be to shut off the fuel pump in the event that the alternator is not ‘switched on’ (i.e. not charging). The idea is that it will shut off the fuel pump in the event of an accident. Where this is the case, it will be necessary to install either a manual electric fuel pump switch or use an oil pressure switch (available from Moroso). The relay is easy to bypass/jump but for safety reasons I won’t even suggest you do so. I suspect it is feasible to use the relay connection on the alternator itself – remember this connection is 0 volts until the alternator is switched on and then it stays at 12 volts until the alternator is not charging (i.e. the engine is not running). As I haven’t tried this yet, I am unable to confirm for certain that it works. On my car, I wired an illuminated cut-off switch for the relay and incorporated it into the centre console. You will also need to decide how you will connect your battery gauge. On later cars this is a voltage gauge and so there is no problem. On the earlier cars this is an amp gauge and this will require a more sophisticated solution if you want the instrument gauge to remain stock. In this case, it may simply be easier to convert to a later voltage gauge or aftermarket gauge. I have also hinted that the relay terminal is used in GM cars in conjunction with the dash warning lamp. When the relay terminal is at 0 volts, the dash light comes on, when it is at 12 volts (i.e. when the alternator is working) the dash light switches off. It should be feasible to get this lamp working however the circuit and wiring may be different for various model years. Having replaced all my gauges with aftermarket units, it was unnecessary for me to get this working for my car. I used a number of sources to put together the information needed for this article. The fact that I couldn’t find all the information I needed in a single place speaks to why I decided to write this. Some technical information, information on their bracket. Datsun 240Z, 260Z, & 280Z 1970 thru 1978 Automotive Repair Manual by Haynes: For the electrical diagram. I also found snippets of information by scouring the internet – performing even simple searches will yield more information on wiring diagrams for amp gauges, dash lights, etc.